*I received this book as an eARC in exchange for an honest review. After their families and friends are murdered by narcos at a family quinceñera, four teens are on the run to escape from La Frontera, the gang responsible for their families deaths, to the United States. In order to escape, they are forced to cross the scorching Sonoran desert. Surrounded by the natural threats of the desert and with La Frontera chasing after them (not to mention the U.S and Mexico border patrol), Marcos, Gladys, Arbo, and Pato must fight to survive. When Steve Schafer approached me about reading and reviewing his new book, I was intrigued. 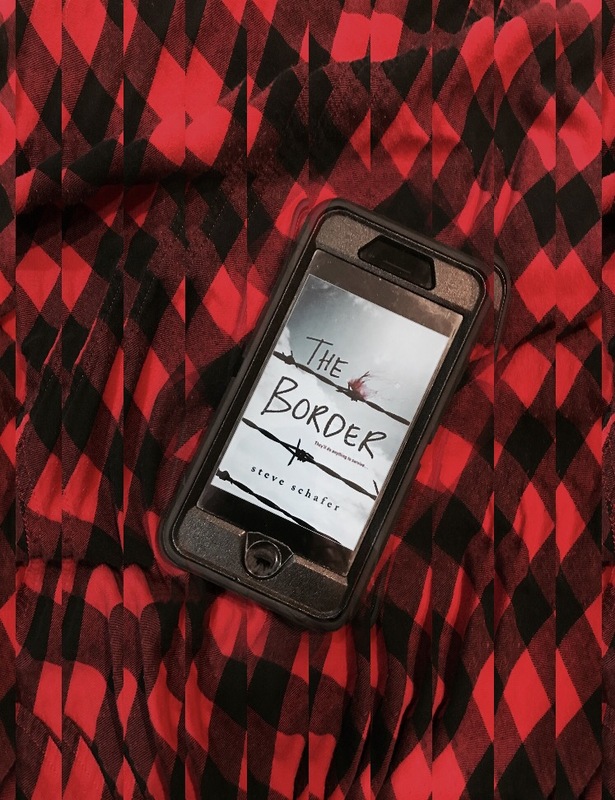 ‘The Border’ examines illegal immigration from a different perspective–the reasons why people are forced to leave their homes and travel to a new country, where they have nothing and know no one. Honestly, I haven’t read a lot of books regarding this subject. Last year, I read ‘Something In Between’ by Melissa de la Cruz which examined the life of a girl living in the United States who finds out that she is here illegally. Clearly, the issue of legal and illegal immigration is a big one currently in the U.S., with many different opinions flying about. With no prior knowledge on the specifics of illegal immigration, I felt that this book created a compassionate, thought-provoking story. It’s easy to look at statistics or read news articles, but to read the experience first hand emotionally connects readers to the issues and puts names to those stats. While fictional, this book depicts the struggles that many people face, and doesn’t shy away from the horror and desperation of the situations. The book starts off pretty quickly, there isn’t a whole lot of exposition which I liked. All of the characters were distinctly their own, and handled the shock and information that was thrown at them in different ways. Told from Pato’s point of view, readers get to see how real people are affected from disasters that, as a nation, we rarely hear of. Often illegal immigrants are painted as monsters, but this novel showcases the humanity behind that stereotype. I liked the connection between how all of the teens knew each other. Marcos and Gladys were siblings, and Pato and Arbo were cousins. At the start of their trek through the desert, it seems uneventful and too easy for the four of them to actually cross the U.S./Mexico border, which Pato does acknowledge. Their trip is never glamorized, or romanticized in any way, which I appreciated as a reader. It feels like a genuine account of what many immigrants experience. I felt as though Gladys and Pato’s relationship moved a bit fast, in terms of how soon they professed their love to one another. However, being close to death in an endless desert is definitely not your average teen love situation, so the circumstances would obviously be a lot different. Pato mentions once that he sees Gladys brother, Marcos in her personality and defiance, and although that is never stated outright again, I liked how Gladys was portrayed as decently strong and independent, and she held her own with the boys. I found the writing style easy to read. Format wise there were a few weird enters etc., but as this is an eARC I totally understand that it won’t look like that in the final copies! There are a few words and very short phrases in Spanish sporadically throughout the book, paying homage to the actual language that is being spoken even though the book is written in English which is really nice. It should be easy for non-spanish speakers to catch on to the meanings. I’ve taken years of Spanish in school, so although I’m nowhere near fluent, I was able to easily understand what was said. Overall, I thought this was a good book and I would recommend it. Books like this one force readers to become emotionally connected to current issues. It’s easy to say ‘stop all illegal immigrations’, many people do, but the issue isn’t as black and white as some make it seem. All angles of issues need to be considered, and this novel creates a great platform to do so.